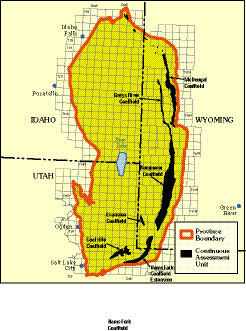 Using a geology-based assessment methodology, the U.S. Geological Survey estimated a mean of 918 billion cubic feet of undiscovered natural gas, a mean of 39 million barrels of undiscovered oil, and a mean of 57.3 million barrels of undiscovered natural gas liquids in the Wyoming Thrust Belt Province. The U.S. Geological Survey (USGS) recently completed an assessment of the undiscovered oil and gas potential of the Wyoming Thrust Belt Province (fig. 1). The province includes all the major thrusts faults within those parts of Idaho, Utah, and Wyoming bounded on the northwest by the Snake River Plain, on the east by the Greater Green River Basin, on the south by the Uinta Mountains and associated structures, and on the west by the easternmost major extensional fault of the Basin and Range Province (fig. 1). The assessment is based on the identification and integration of geologic elements, including hydrocarbon source rocks (source-rock maturation, hydrocarbon generation, and migration), reservoir rocks (sequence stratigraphy and petrophysical properties), and hydrocarbon traps (trap formation and timing). By using this geologic framework, the USGS defined two Total Petroleum Systems (TPS), each containing one Assessment Unit (AU), as follows: (1) Mowry Composite TPS and Thrust Belt Conventional AU (fig. 2); and (2) Frontier-Adaville-Evanston Coalbed Gas TPS and Frontier-Adaville-Evanston Coalbed Gas AU (fig. 3). Quantitative estimates of the undiscovered oil and gas resources in each of the AUs are listed in table 1. Figure 1. 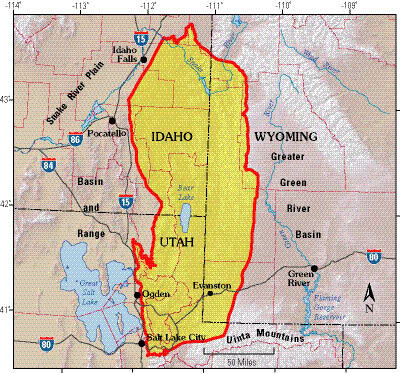 Wyoming Thrust Belt Province of southeastern Idaho, northwestern Utah, and western Wyoming. Figure 2. 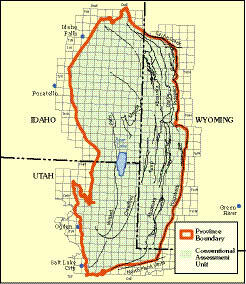 Thrust Belt Conventional Assessment Unit and major thrust faults within the Wyoming Thrust Belt Province. The assessment unit area is the same as	the extent of the Mowry Composite Total Petroleum System boundary. The Mowry Composite TPS is defined as a composite system because, although the source is dominated by the Cretaceous Mowry Shale and the correlative Aspen Shale, it also may have contributions from organic-rich beds in the Cretaceous Bear River and Frontier Formations and possibly minor contributions from the Permian Phosphoria Formation. The Frontier-Adaville-Evanston Coalbed Gas TPS is a hypothetical petroleum system consisting of Cretaceous and Tertiary strata preserved in narrow elongate synclines parallel to the trend of the major thrust faults. The main coalfields (fig. 3) having coalbed methane potential include the Coalville and Hams Fork coalfields in Utah, and the Evanston, Kemmerer, Greys River, and McDougal coalfields in Wyoming. Figure 3. Mapped extent of the Frontier-Adaville-Evanston Coalbed Gas Total Petroleum System and Assessment Unit. Locations of major coalfields shown. The USGS assessed undiscovered conventional oil and gas and undiscovered continuous (unconventional) gas in the two TPSs, resulting in estimated means of 918 billion cubic feet (BCF) of undiscovered natural gas, 39 million barrels (MMBO) of undiscovered oil, and 57.3. million barrels of undiscovered natural gas liquids (MMBNGL) (table 1). About 61 percent of the gas (557 BCF) and all of the oil (39 MMBO) and natural gas liquids (57.3 MMBNGL) are contained within the Mowry Composite TPS and its single AU. The remaining 39 percent of the gas resource is continuous and contained within the Frontier-Adaville-Evanston Coalbed Gas TPS and AU. Click on the table for a version that is high resolution. Mark A. Kirschbaum (Task Leader; mkirsch@usgs.gov), Ronald R. Charpentier, Robert A. Crovelli, Timothy R. Klett, Richard M. Pollastro, and Christopher J. Schenk. Document Accessibility: Adobe Systems Incorporated has information about PDFs and the visually impaired. This information provides tools to help make PDF files accessible. These tools convert Adobe PDF documents into HTML or ASCII text, which then can be read by a number of common screen-reading programs that synthesize text as audible speech. In addition, an accessible version of Acrobat Reader 6.0, which contains support for screen readers, is available. These tools and the accessible reader may be obtained free from Adobe at Adobe Access.